Three Austrian men were the first to undergo a new “bionic reconstruction” procedure, which enabled them to use mind-controlled prosthetic hands. The patients all suffered from brachial plexus injury, which has been called an “inner neurological amputation” because it completely separates the hand from its owner’s control. After extensive training and preparation, the mechatronic devices replaced the biological hands, restoring function and improving their quality of life. The brachial plexus is a critical network of nerves that originate in the cervical spine region, passing below the shoulder and into the upper extremity. This important neurological assembly is responsible for the movement and sensation in the shoulder, arms, forearms, and hands. Damage to the brachial plexus can be caused by high-speed collisions like motorcycle or snowmobile accidents, as well as sporting activities like American football or rock climbing. “In effect, brachial plexus avulsion injuries represent an inner amputation, irreversibly separating the hand from neural control. Existing surgical techniques for such injuries are crude and ineffective and result in poor hand function,” Professor Oskar Aszmann, director of the Christian Doppler Laboratory for Restoration of Extremity Function at the Medical University of Vienna, explained in a recent press release from The Lancet. In an effort to improve on current treatments, Professor Aszmann and his team developed a new approach they call “bionic reconstruction.” The method is a multistage process that culminates in the elective amputation of the patient’s hand, which is then replaced with a mechatronic prosthetic. In as little as three months after amputation, the recipients’ were able to perform several complex activities, while enjoying less pain and an improved quality of life. The bionic reconstruction process was conducted in a two stage approach, according to a recent study published by the team in The Lancet. First, an extensive training program was undertaken while the limb was intact. The goal of this phase was identification of portions of the limb that could provide functional electromyography signals to the mechatronic device. Once these areas were identified, a training program specifically designed for each patient was implemented using the electromyography signals and a virtual hand. Upon mastery of the virtual hand, a prosthetic hand was affixed to the non-functioning hand, so further refinement could be achieved. Each patient spent an average of nine months preparing and training before moving on to the second phase of the program. The next phase of the project consisted of elective amputation of the biological hand and replacement with the mechatronic robotic hand. 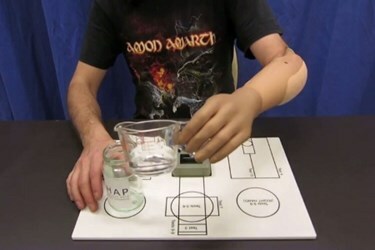 Patients were fitted with their new prosthetic as soon as six weeks after amputation, and measurements taken at three months indicated that each patient was successful at using their new hand. Using the Action Research Arm Test, the patients’ score increased from 5.3 (SD 4.73) to 30.7 (SD 14.0). The mean Southampton Hand Assessment Procedure scores also improved from 9.3 (SD 1.5) to 65.3 (SD 19.4) as did the Disabilities of Arm, Shoulder and Hand score, which went form 46.5 (SD 18.7) to 11.7 (SD 8.42). Based on these results, the team concluded that bionic reconstruction was a viable treatment approach for patients suffering from a global brachial plexus injury that have no other treatment options. Robotic prostheses are rapidly increasing in their capabilities and are helping patients function in situations where they previously had few options. For example, a shoulder-level double amputee was recently able to perform complex tasks by simultaneously using a pair of robotic prosthetics. Other recent research enabled a quadriplegic woman to operate a robotic device using only her brain wave activity as she imagined a movement.